POLLYWOG is a tender, rowboat, motorboat, just about anything for a family. Above all it's portable and rugged. Loading nested Pollywog into S-10 pickup truck. Testing POLLYWOG for Balance: "Rocking the Boat". Well, after less than 2 months of construction, the Pollywog has successfully completed it's maiden voyage. As you know, I built this boat as somewhat of a universal, transportable, do-it-all kind of craft. Right now it is a 2 part row boat and tender. Soon it will have a mast, boom, rudder and sail, to transform it into a daysailer. Later on, an outboard motor will be added, to complete the metamorphosis. 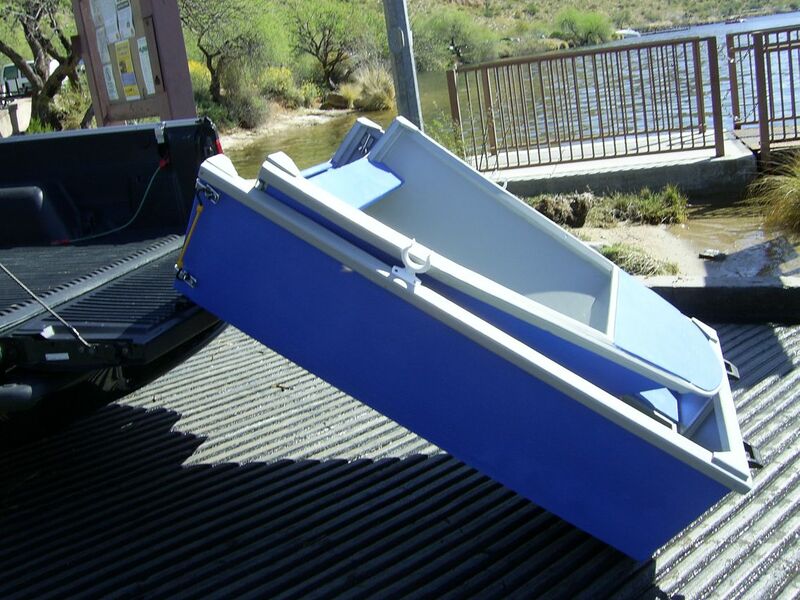 "FYI : The flat bottom design was finally chosen for ease of assembly, loading, beaching and storage. As a result, high speed and maneuverability are not one of the boats key attributes." "Note: If, for any reason, the width of the finished boat is a few inches too wide for your use (won't fit in your SUV), reduce the width of the bulkhead and transom dimensions 3 inches maximum to satisfy your needs. All other dimensions can remain the same." "Note: This boat pretty much shapes itself; no forms are required to obtain the desired configuration. The bulkheads and self-forming side panels do all the work. As a result, only simple but precision cuts are required to achieve a great looking and functioning boat." "At this point in the build (basic hull structure) it is important to mention that you may want to make some changes to the seating, storage or buoyancy areas, to better suite your needs. Doing so should not affect the integrity of the design, and will provide you with a ‘custom’ boat, of which you will be proud to say, 'I built it.'." 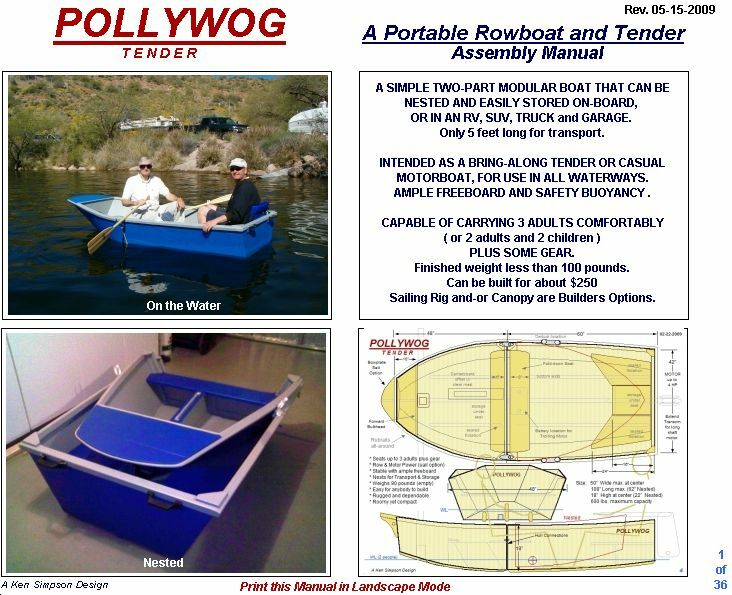 "Designer comments: The original intent of the Pollywog design was to create a transportable work boat (no trailer required), capable of carrying 3 adults, plus gear, and small enough to sit nested on the deck of a larger boat. To that end Pollywog works just fine. During the final design phase, however, it seemed reasonable that this easy to build little boat could also serve as a daysailer, and the design was modified slightly to accommodate a sailing rig. The hull shape, curved with steeply angled sides and ample freeboard, would provide adequate performance for a boat this size. The end result is a boat that can serve many different purposes and functions, and still be easy to build, operate, transport and store on-deck or in a garage." As you can see, much thought and consideration has gone into the creation of the Pollywog, so named after the small Amphibian that morphs into a Toad. This 2 part nesting boat can sit atop the deck of a larger ship, consuming less than 20 square feet of space. Yet, morphed to 9 feet in length, it can transport 3 people, plus gear, to distant places with security provided by the built-in buoyancy and ample freeboard. This is truly a workboat, weighing less than 100 pounds, that can go anywhere and do anything, and costing only about $250 to build. I am sure readers will be intrigued by the concept, which is an outgrowth of the Toter series of designs, this being the largest to date. The sailing option is in the construction phase, the centerboard slot already incorporated in the build, as the photos will show. Sail area should be approximately 40 square feet, supplying adequate power to the craft, but keeping within the easy-to-handle and safety requirement that the design embodies. 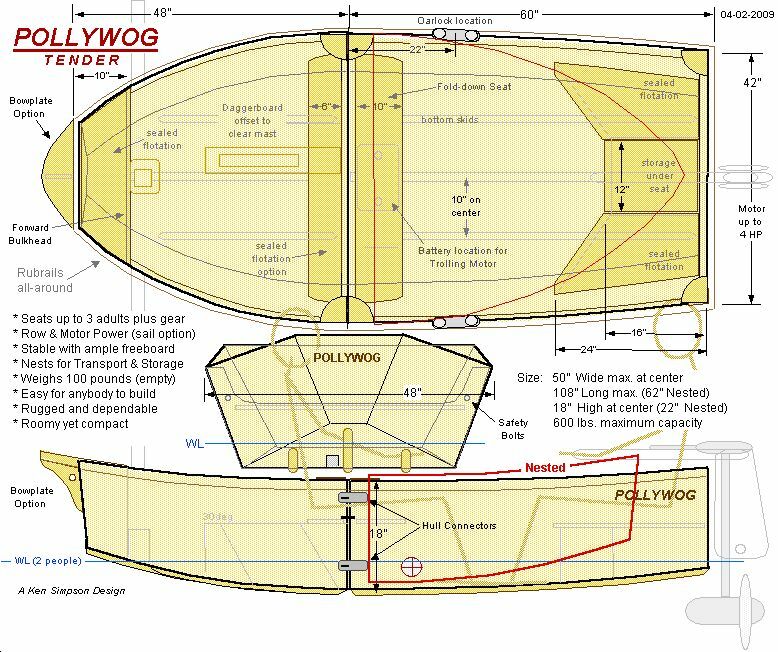 Plans for the Pollywog are available now, and include many construction photos, as well as maiden voyage photos. Plans for the sailing components, mast, boom, rudder, centerboard and sail, will be offered later as an option, when sea trials are complete. I must say that my first in-water impressions were very good. 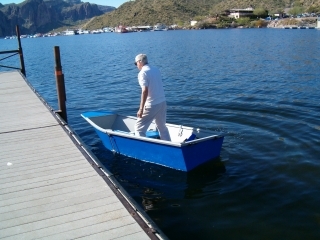 The boat is stable, and one can actually stand and walk around, albeit in a very small space. Two people balance the boat just right, as the photos shows. There is more than ample freeboard, which should dispel any fears that small boats can sometimes generate. A boat built to the plans would balance even better, as a few dimensions were changed to move the CB slightly. The mast, 12 feet high, will be made in 3 sections that fit together in an unusual way. This is to keep all components easy to store on board. The mast will be supported by 3 stays, to provide rigidity and strength. The rudder will be of a flip-up design, and the centerboard, which angles back 30 degrees, will be easily removable. All told it took exactly 45 days to build Pollywog, mostly 1/2 days, with some late nights. It was a fun and interesting project, and I look forward to the sail rig to be completed so that I can enjoy the gentle breezes that pass through here in the summer months.